Description: Complete the circuit 3 or 4 times through. Warm-Up: Begin with a light, 1-mile jog on the treadmill (or outside) or 10 minutes easy on the elliptical to get your heart rate up. 10 Heisman Single-Leg Squats: Begin standing on your left leg holding a medium-size dumbbell. Drive your right leg bak and sink down into a single leg squat. Sit back and keep your knee over your ankle and your core engaged. Make sure your weight stays in your heels. Twist your core and bring your right elbow to your left knee. Repeat 10 times on EACH leg. 20 Alternating Singl- Leg Lateral Hops with Bear Hug: Begin standing on your right leg with your arms crossed at your chest. Lower down into a squat stance and explode off your right foot landing on your left foot in the same low squat stance. Make sure to land light on your feet with the weight in your heels. Keep your arms tucked into your chest at all times to rev up your core stability. :45 Single Leg Hip Bridge: Begin laying on your back with with your left foot on top of a physio ball and your right leg floating in the air. Lift your hips up into the air and hold for 45 seconds. Then, repeat on the other side. 20 Alternating Plank Rows with Dumbbells: Begin in a high-plank pose with two medium-size dumbbells in your hands. Keeping your hips square to the ground, inhale and row your left arm up, stopping when your elbow hits your ribs. Hold for two seconds and then release. Alternate sides. Modification: Drop down to your knees and/or use lighter dumbbells. 10 Rolling Sit Ups to Overhead Press: Begin seated with your feet hip-width distance holding 2 light or medium-size dumbbells. Roll back into a ball, pulling your knees into your chest, keeping the weights at your shoulders. Then, come forward, plant your feet and perform a shoulder press. Keep your chest lifted and back flat. Disclaimer: Please consult your doctor before starting a new fitness regime. While Lee from Fit Foodie Finds and Monique from Ambitious Kitchen consulted with professional trainers for the Summer SWEAT Series fitness program, you are participating at your own risk. Please modify and listen to your body. Description: Complete each exercise for reps. Do each exercise 10 times. Do each exercise 9 times.…8, 7, 6…1. Decline Push Ups on Physio Ball: Begin in a high plank pose with a physio ball plead under your shins. Make sure to keep your shoulders over your wrists and your core tight. On the inhale, lower down into a push-up, leading with your chest. On the exhale, reset back to plank. Modification: Do normal push-ups on your toes or knees. 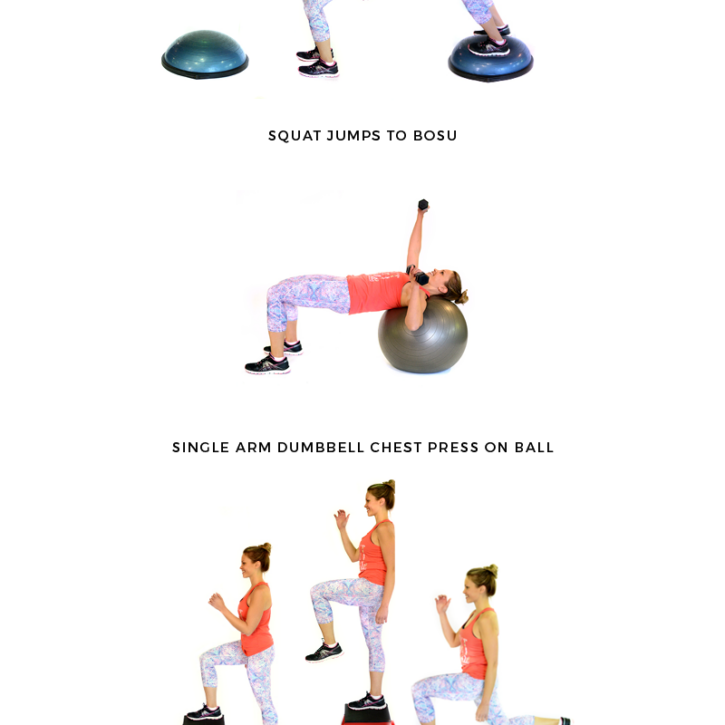 Squat Jumps to Bosu: Begin with a bosu ball about 3 feet in front of you. Start with your feet hip width distance apart. Lower down into a squat, keeping your chest up and weight in heels. Explode off your feet landing in a squat on top of the bosu ball. Then, explode off the bosu ball and land back where you started. Modification: do normal jump squats or bodyweight squats. Single Arm Dumbbell Chest Press on Ball: Begin with your upper back and neck resting on a physio ball. Place your feet hip-width distance apart and grab a set of medium-weight dumbbells. Using your core to balance, lift both arms in the air. Then, perform a single arm chest press by bringing one arm into a T. Then reset back to center and repeat on the other side. Single Leg Step Up to Reverse Lune: Begin standing in front of a bench. Then, step up onto the bench with your right leg and lift your left knee up into a 90 degree angle balancing on one foot. Then, step down with your left foot, and perform a 90/90 lunge, stepping your right foot back. Repeat 10 (9, 8, 7…) on each side. Challenge: hold a light or medium set of dumbbells. Lateral Bounds: Set two cones about 10 yards from each other. Get low, and shuffle back and forth between the cones, tapping the ground every time you get to one end. There and back = 1. Guess what I did over the weekend? Hopped on a plane to AZ to see Tony for Easter! I didn’t really have it all planned but was hanging out with Lee and brought up the idea; she told me to just go for it so I booked a trip, borrowed some of her clothes and jetted off! I can’t tell you how incredible it was to see the look on his face. Me being there was completely unexpected. Here’s a little more detail on how I was able to pull it off: While driving to his hotel from the airport, we chatted on the phone and I told him I was going out for dinner with a girlfriend all the while he was thinking that I was in Minnesota. He said he was just watching basketball and hanging out so it was just my luck that he happened to be at his hotel. I arrived and as soon as I got to his room, I placed a Reese’s Egg in front of the door (they are our favorites! ), knocked loudly then ran around the corner. He opened the door with a confused look on his face, then I peeked around the corner, we both got huge smiles on our face and I came running in for a hug. Totally cute stuff. The rest of the weekend was spent watching Netflix, eating and enjoying time relaxing. Do not ask me how I get any work done these days. I can’t wait for April to come so I can have a week or two at my own apartment. Oh hi! Can you believe it’s already April? I CANNOT wait for patio season here in Chicago and heading to some baseball games at Wrigley! Lately It’s been so much fun to see everyone out and about during the weekdays and of course, the lake shore has been packed with people running, walking and biking. It’s nothing like running around the track on the Princess Cruise ship when it’s sailing the ocean, but it’s definitely still beautiful. Of course, we all know that Summer follows Spring and certainly that it’ll be time to hit the beach. I don’t know about you, but my abs always need some work before bikini season. They’re one of the hardest muscles to work and achieve a nice, toned look. 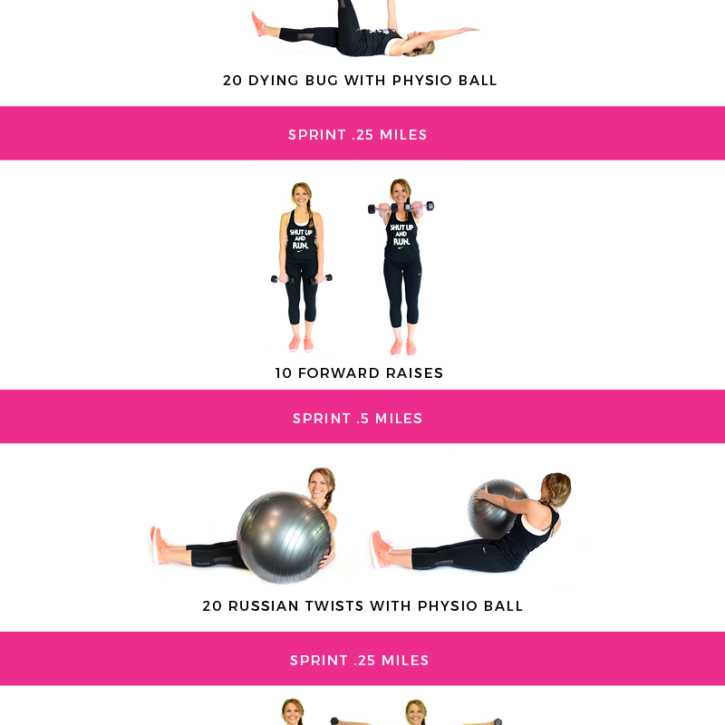 But who doesn’t love a good workout challenge?! I’m teaming up with Lee from Fit Foodie Finds again to bring you another at home heart-pumping workout! Yep, that’s right — this workout can be done anywhere and will absolutely help to tone up your abs. You can do it every day if you’d like, or every other day. I never get sick of these exercises plus it’s always fun to work up to a full set if you are new to working out. Oh hi there! How’s your week been so far? Lately I’ve been traveling quite frequently so keeping the days straight is difficult, if not impossible. This past week I was in Arizona, spending time with Tony while he’s in Spring Training for baseball. We had a completely wonderful time checking out restaurants, climbing Camelback mountain and going on lots of walks. I LOVE being able to stay active while away from home, how about you? Complete the circuit 1 to 2 times through doing cardio of choice (treadmill, elliptical, bike, row). 20 Dying Bug with Physio Ball: Begin lying flat on your back. Place a physio ball between your right palm and your left shin. Press firmly into the ball. Extend your left arm long and your right leg long. Point your toes. Then, switch sides and do the same thing with the physio ball between your left palm and your right shin. Alternate 20 TOTAL times. 10 Forward Raises: Begin standing with your feet hip-width distance apart holding a set of light/medium-size dumbbells in front of your body. On the inhale, raise the dumbbells forward with your palms facing the ground so that they come shoulder height. Keep a slight bend in your elbows so that you do not hyper extend. On the exhale, release back down. 20 Russian Twists with Physio Ball: Begin seated with your legs extended in front of you. Holding the dumbbell in front of you with straight arms, twist to the right, engaging your obliques. Then, twist to the left. Make sure to keep your chest lifted and back flat. Exhale with each twist. 10 Lateral Raises: Begin standing with your feet hip-width distance apart holding a set of light/medium-size dumbbells on the sides of your body. On the inhale, raise the dumbbells out to the side with your palms facing the ground so that they come shoulder height. Keep a slight bend in your elbows so that you do not hyper extend. On the exhale, release back down. 20 Sit-Ups on Physio Ball: Begin with the small and middle of your back positioned on a physio ball. On the inhale, roll your back against the ball to open up your chest. On the exhale, engage your core and slightly lift your chest off the ball to perform a sit-up. Repeat. Modification: Perform a normal sit-up on the ground with no physio ball. This post is sponsored by Finish Line as part of the Summer SWEAT Series. I was compensated and all opinions are my own. Thanks for supporting AK! Description: Complete each exercise for 20 seconds, then rest for 10 seconds. Do each superset tabata 4 times then rest for 90 seconds before moving into the next superset tabata. Warm-Up: Start with a 1 mile jog on the treadmill or 10 minutes on the elliptical. Single Leg Lateral Lifts: Begin standing on one leg holding medium-sized dumbbells. Then, perform a lateral lift, by raising your arms so that they are shoulder height. Keep a slight bend to your elbows, making sure not to lock them out. Reset to your arms by your side. Alternate legs each round. Squat Kettlebell Clean: Begin standing holding a kettle bell between your legs. Lower down into a squat, keeping the weight in your heels and your chest up. Explode into a standing position and catch the bottom of the kettle bell right in front of your chest. Reset. Modification: Use a lighter weight or perform bodyweight squats. Alternating Plank Shoulder Taps: Begin in a high plank pose with your shoulders stacked over your wrist. Alternating back and forth, touch your opposite hand to your opposite shoulder. Make sure to keep your hips as square to the ground as possible. Modification: Hold a high plank or drop down to your knees and perform alternating shoulder taps. Russian Twist with Physio Ball: Begin seated with your legs extended forward, holding a physio ball (or medium-size weight). Hinge back slightly and hold the ball in front of you. Work your obliques by twisting to the right and then to the left. Alternating Forward V-Lunge + Bicep Curl: Begin standing holding medium-sized dumbbells. Then, step forward with your right leg into a 90/90 lunge keeping your chest up. Perform a bicep curl. Then reset back to standing. Alternate sides. Plank on Physio Ball: Come into a four arm plank with your four arms positioned on top of a physio ball. Make sure to keep your hips lifted and your spine in one long line. Hold and breath. Modification: Hold a normal four arm plank without the physio ball. Option to drop down to your knees. Alternating Dying Bug with Physio Ball: Begin lying flat on your back. Place a physio ball between your right palm and your left shin. Press firmly into the ball. Extend your left arm long and your right leg long. Point your toes. Then, switch sides and do the same thing with the physio ball between your left palm and your right shin. Alternate 20 TOTAL times. Varsity: Do the entire circuit one more time! 15 Diamond Push Ups: Begin in a high-plank pose or on your knees for the modified version. Create a diamond with your thumbs and pointer fingers. On the inhale lower down into a push-up, leading with your chest, keeping your elbows close to your sides. On the exhale, press back up into plank. 15 Dumbbell Chest Press to Standing Overhead Press: Begin laying on a bench with medium to heavy dumbbells in both hands. Perform a chest press by putting your arms in a goal-post position and pressing your arms together on the exhale engaging your chest muscles. Release back down into a goalpost stance and then use your core to sit up on the bench. Stand up and perform a shoulder press by bringing your arms to a goal-post position and pressing up on the exhale. Return back to laying on the bench. 10 In-and-Out on Physio Ball + 10 Lateral Taps: Begin in a high plank position with your shins positioned on top of a physio ball. Keeping your core tight, pull your knees into your chest. Make sure to keep your shoulders stacked over your wrists. Do this 10 times. Then, reset back into high plank with your shins on top of the physio ball. Lift your right leg off the ball and tap it on the ground, then do the same with your left. Do this 10 times on each side. :30/leg Side Plank Leg Extensions: Begin in a side plank with your right arm on the ground. Make sure to keep your hips up and your body in one long line. Then, lift your left leg off of your right and hold for 30 seconds. Do the same thing on the left side. Modification: Simply hold your side plank and do not lift your leg. Ever since I started to do Wellness Wednesdays, many of you requested workouts or a glimpse at what my workouts look like each week. I decided to get together with Lee from Fit Foodie Finds while we were on Princess Cruises to put together a body sculpt series workout for you all. Lee and I both LOVE working out so when Princess Cruises offered a body sculpt class on the ship, we signed up immediately. To our surprise, the workouts were both challenging and FUN! As a result, we decided to take a few of the moves and put them into a guided 30-minute workout that you can do at home (or while traveling!). The best part? There are no weights required if you are a beginner! Plus you can take each workout at your own pace and modify each exercise if necessary. 15 Single Leg Squats on Physio Ball (per leg): Begin standing on you left leg with the physio ball behind you, under your right ankle. Drive your right knee back, lowering down into a squat. Keep your left knee stacked above your ankle and chest lifted. On the exhale, reset back to the start. Perform 15 single leg squats on each leg. Both legs = 1 rep.
:30/Leg Single Leg Hip Bridge Hold (per leg): Begin lying on your back. Plant your left foot on the ground and raise your right leg so that your knees are parallel. Lift your hips into the air, making sure to keep your body in one long line. Hold and breathe for 30 seconds. Repeat on other side for 1 rep.
15 Neutral/45/90 Single Leg Glute Lifts (on each leg): Begin laying on your left side with spine in a neutral position. Lift your left leg in the air, driving with your heel. Repeat 15 times. Next, bring your right leg so that it creates a 45 degree angle with your body. Lift your left leg in the air, driving with your heel. Repeat 15 times. Last, bring your right leg so that it creates a 90 degree angle with your body. Flex your left foot and lift in the air. Repeat 15 times. Do this whole circuit on both legs. 10 Calf Raises to Squat: Using a pole (wall or chair) for balance, begin with your feet hip-width distance apart. Come into a calf raise, lifting your heels off the ground. Then, lower down into a squat, driving your hips backward, keeping your knees above your ankles. On the exhale, come back to standing keeping your calves raised the entire time. Repeat. 20 Russian Twist with Physio Ball: Begin seated with your legs extended in front of you. Holding a physio ball (or dumbbell) in front of you with straight arms, twist to the right, engaging your obliques. Then, twist to the left for 1 rep. Make sure to keep your chest lifted and back flat. Exhale with each twist. 20 Alternating Dying Bug: Begin lying flat on your back. Place a physio ball between your right palm and your left shin. Press firmly into the ball. Extend your left arm long and your right leg long. Point your toes. Then, switch sides and do the same thing with the physio ball between your left palm and your right shin. Alternate 20 TOTAL times. 20 Alternating Pointers: Begin in table top pose with a neutral spine, your shoulders directly over your wrists and your hips over your knees. On the inhale, extend your right arm long, keeping it shoulder height and your left toes long, keeping it hip-height. On the exhale, reset back to tabletop. Repeat 20 times TOTAL (10 on each side).